In an attempt to iron out some of the confusing aspects of the Discover Pass requirement, the 2012 legislature has approved new changes to the Discover Pass, allowing a single Discover Pass to be used for two vehicles. In addition, according to an Associated Press story published on March 30, 2012, Governor Gregoire has signed into law a bill that will create a $50.00 Discover Pass that can be transferred among family vehicles. For purchasing the pass at a license dealer, you will also pay an additional transaction fees of $5.00 for a yearly pass, or $1.50 for a daily pass. The fine for not displaying the pass is $99. Let’s do some review. The pass is required for use in state recreation lands and water-access sites managed by Washington State Parks (State Parks), Washington Department of Fish and Wildlife (WDFW) and Washington State Department of Natural Resources (DNR). These lands include state parks, water-access points, heritage sites, wildlife and natural areas, DNR and WDFW campgrounds, trails and trailheads and all DNR managed uplands (natural areas and trustlands) but not aquatic lands. How many passes do motorcyclists need? As an owner of five motorcycles and a car, the state would like to see me buy three two vehicle passes. That's not going to happen. Motorcyclists are required to declare the Discover Pass if requested by an officer. The pass is in the top left pocket of my jacket along with a pen. The lines for vehicle plate numbers it's associated with are still blank. If and when I'm asked to present the pass, I'll fill in a plate number then. So far no one has asked me for my pass. If your Off-Road Vehicle (ORV) is required to display an ORV tab, you do not need a Discover Pass for that vehicle. You will need a Discover Pass for the street-legal vehicle (but not the trailer) that transports your ORV to a state recreation site. For street-licensed vehicles, such as dual-sport motorcycles or four-wheel-drive vehicles, the operator/rider will be required to present a pass upon request by an officer. You will still have the doubled fees for both the transporting vehicle (when parked at locations requiring the Discover Pass) and an ORV tab, where applicable. There are several questions one can ask. First, why charge a family an increased fee for using the pass for more than two cars? While it is likely that by covering two cars, the $30 Discover Pass will work for most families, why the unnecessary further expense to families already hard-hit by tough economic times? Why not simply make it a universal pass that stays with the vehicle’s operator(s)? Secondly, if you bought two Discover Passes for $30 each for two cars when the law first took effect, can you get a refund on one, since a $30 pass is now good for two cars? How about "trading in" the $60 worth of passes to get one $50 family pass and a coupon good for a couple of fish tacos at Taco Time? What if I decide I don’t need or don’t want the Discover Pass after I’ve purchased it? You may request a refund within 60 minutes of purchasing a pass through the WDFW dealer where you purchased the pass. It’s nice that they give you a full hour to change your mind. A Fish and Wildlife Vehicle Use Permit (for those not holding a fishing or hunting license) is required for entry. The cost is $12.00 for two listed cars. A Vehicle Use permit purchased between April 1, 2011 and June 30, 2011 will be good until March 31, 2012 on Fish & Wildlife lands only. After July 1, 2011, a vehicle pass is available only to those purchasing a valid hunting or fishing license and good only on Washington Fish & Wildlife lands. My first question here would be why would you buy a vehicle use permit for $12 ostensibly for parking at an area used for fishing or hunting if you didn’t have a fishing or hunting license? Let’s not even discuss the valid date information, whether you need a vehicle pass, or if one is included with the fishing and hunting license, as the information in this one paragraph is simply obtuse. If it all seems utterly confusing to you, we have a Q&A that will help you to determine which pass or passes are best for your hiking destinations and style. 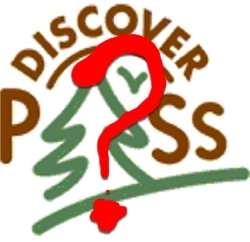 With all due respect to the state’s budget problems, initial reports about the Discover Pass indicate that the anticipated revenue that was supposed to be generated by the pass is falling short of expectations, and the most obvious reason for this is that it is simply too confusing to wade through the myriad of requirements to simply enjoy a day at the park. A literally "alphabet soup" of agencies and convoluted system of licenses and fees has had the net effect of causing fewer citizens to use state parks and lands. I believe the state could even make a case for a well-organized state agency and fee structure to support state parks and lands, including new land purchases, and I believe that people would support reasonable fees to pay for park and land use, but therein lies the problem. In the opinion of this writer, whatever funding problems exist for state lands will not be solved until both the number of land management agencies and overlapping fees and regulations are consolidated into a simpler, more straightforward, more efficient and more logical system. Creating one Department of Natural Resources (DNR) for the state of Washington and consolidating all other state agencies, having a simplified fee structure that uses one database for all customers, for both commercial and recreational use of state lands, will have the effect of cutting operating costs, offering better service to the citizens of Washington State, and would go a long way toward solving the problems in maintaining state lands. Philip Buonpastore is a freelance moto journalist living in Washington State. His latest book is Shifting Gears at 50 is available now.